Protesters gathered to oppose the deportation of a Montreal non-status rights activist Thursday afternoon, outside Guy-Favreau Complex on René-Lévesque Blvd. W. Photo Miriam Lafontaine. People gathered outside the Guy-Favreau Complex on René-Lévesque Blvd. 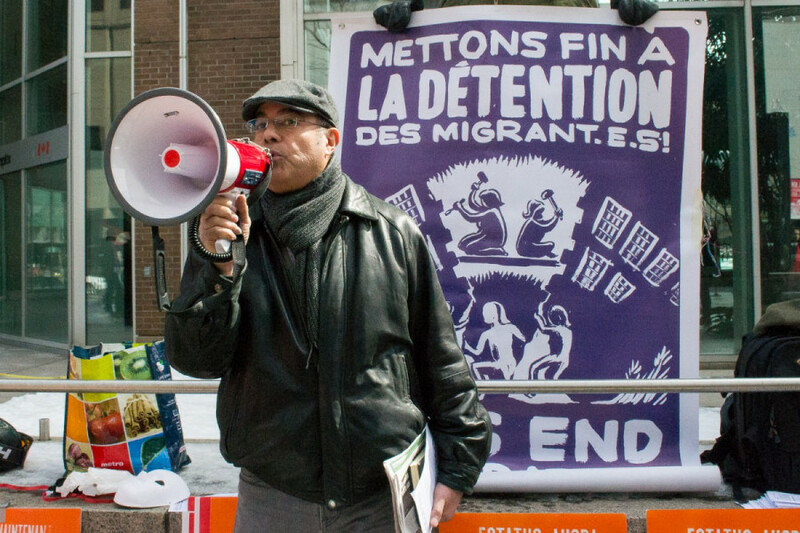 W. Thursday to fight the deportation of Lucy Francineth Granados, an undocumented woman who protesters say was very active in the Non-Status Women’s Collective of Montreal. The deportation hearing of Francineth Granados was happening inside the building. Her deportation was set for March 27, meaning she’ll have to return to her home country of Guatemala. “It’s evident to us that there’s wide discrimination and vulnerability for all those who live without status,” said Frantz Andre, who works with the Comité d’action des personnes sans statut. “We can’t accept this kind of violence,” he said. In light of Montreal’s declaration as a sanctuary city, protesters want Mayor Valérie Plante and the city will publicly oppose the deportation, and step in to try to defend Francineth Granados, who’s been in the country for nine years. The initial declaration made under Denis Coderre’s administration in February 2017 promised undocumented people would have the right to use services provided by the city without the risk of being reported to immigration services. Since its adoption, the city has been criticized by community groups who say the declaration remains symbolic, since the Montreal police have yet to end their collaboration with the Canada Border Services Agency. Throughout 2017, in the months following the declaration, there was little change in the number of times police contacted the CBSA to inquire about someone they thought might be undocumented in comparison to the year before, as was revealed through an Access to Information Request to the CBSA filed by The Link. In 2016, the police made 2,389 calls to the CBSA to inquire about a person’s status—meaning they interacted with someone who they thought might be undocumented and called the CBSA to confirm if this was the case. In the following year, police made 2,311 calls to the CBSA for the same reason. Francineth Granados was taken from her home at 6 a.m. on Tuesday morning by the CBSA. The Immigrant Workers Centre and Solidarity Across Borders, two groups who give support to non-status people in the city, claim that in being taken from her home, officers used excessive force against the woman, injuring one of her arms, which is now swollen. Francineth Granados went to work in Canada following the death of her husband so she could support her three children, who live with their grandmother in Guatemala. She tried applying for refugee status, but remained in Montreal undocumented as her claim was denied. 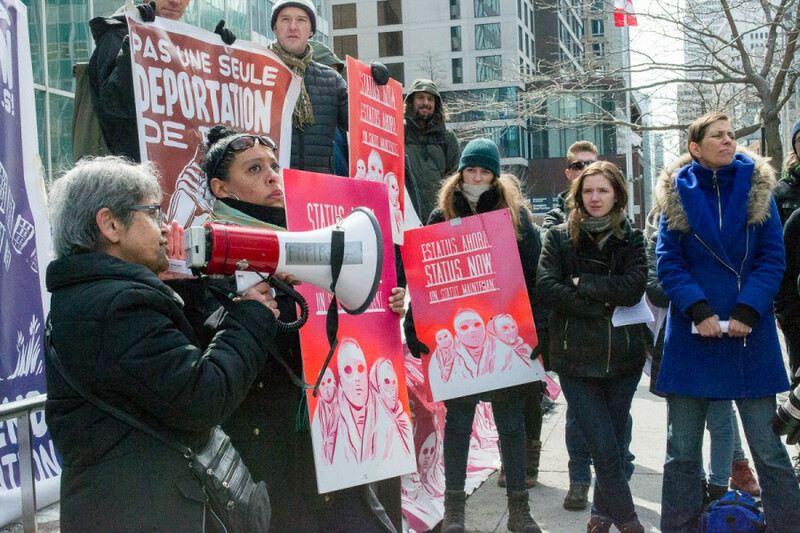 Protesters are also calling on Public Safety Minister Ralph Goodale to suspend her deportation, and asking that Immigration Minister Ahmed Hussen accept her pending immigration application, which she filed last summer.